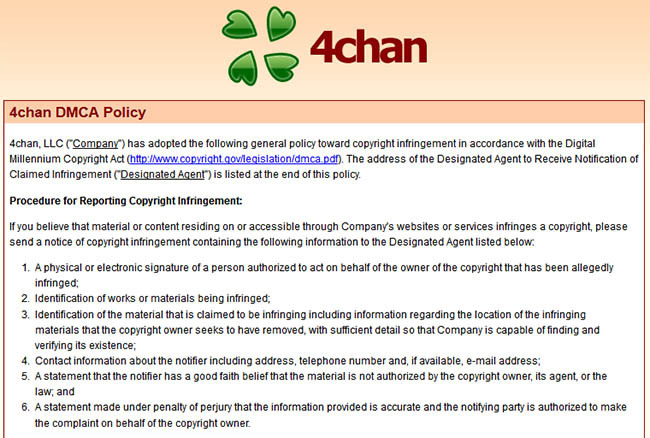 After doing without an element needed for safe harbor protection, 4chan has just introduced an official DMCA policy. The decision comes in the wake of the celebrity photo leak known as The Fappening and 4chan users' connections to it. In the meantime, the leaked image library has clocked a million torrent downloads. Every now and again a phenomenon takes the Internet by storm. They’re situations that the term ‘going viral’ was made for. A couple of weeks ago it was ice buckets, and since the weekend its been leaked celebrity pictures. The event, which needs little introduction, saw the iCloud accounts of many prominent female celebrities accessed illegally and their personal (in many cases intimately so) photographs leaked online. The FBI are investigating and for the leakers this probably isn’t going to end well. But for the users of 4chan this leak, which was rumored to have begun on the board itself, was the gift that just kept on giving. Excited users quickly came up with a portmanteau based on ‘happening’ plus ‘fapping’ and The Fappening was born, a prelude to taking the Internet by storm. While the event itself appears to be dying down, the leak and the worldwide attention it bestowed on 4chan may have prompted a surprise decision by the site’s operator. Whether the leak was directly responsible will become clear in due course (we’ve reached out to the site for a response), but sometime yesterday 4chan introduced a DMCA policy. The policy registers a DMCA agent for 4chan, which helps to afford the site safe harbor protection under the Digital Millennium Copyright Act. Although not yet listed in the numerical section of Copyright.gov, the designated agent will now become the point of contact for copyright complaints and DMCA notices when content owners believe that their ownership rights have been violated on 4chan. While most US-based user-generated content websites should not entertain operating without safe harbor, the way 4chan is set up provides a unique scenario in respect of infringing content being posted by its users. “Threads expire and are pruned by 4chan’s software at a relatively high rate. Since most boards are limited to eleven or sixteen pages, content is usually available for only a few hours or days before it is removed,” the site’s FAQ explains. 4chan’s Chris Poole (‘moot’) previously told the Washington Post his deletion policy was both a necessarily evil and a plus to the site. “It’s one of the few sites that has no memory. It’s forgotten the next day,” he said. Despite the board’s userbase being notoriously rebellious, the deletion policy appears to work well. To date Google’s Transparency Report lists takedowns for just 706 URLs. Of course, it’s not only companies such as Viacom on the warpath. Yesterday a spokesman for Jennifer Lawrence said that the authorities had been contacted and anyone found posting ‘stolen’ photos of the actress online would be prosecuted. While the scope of that action isn’t entirely clear, many of the leaked photos were ‘selfies’ to which Lawrence has first shout on copyright. They’re still being posted on hundreds if not thousands of Internet sites even today, so having a DMCA policy in place will help those sites avoid liability, even if in 4chan’s case the images are only present for a few hours. In the meantime, sites such as The Pirate Bay who care substantially less about copyright law than 4chan does today are continuing to spread the full currently-available ‘Fappening’ archives at a rapid rate. Statistics collected by TorrentFreak suggest that the packs have been downloaded well over a million times.